The security community was moving very fast to take actions and sinkhole the Satori botnet C2 after our December 5 blog. The spread of this new botnet has been temporarily halted, but the threat still remains. Starting from 2018-01-08 10:42:06 GMT+8, we noticed that one Satori’s successor variant (we name it Satori.Coin.Robber) started to reestablish the entire botnet on ports 37215 and 52869. What really stands out is something we had never seen before, this new variant actually hacks into various mining hosts on the internet (mostly windows devices) via their management port 3333 that runs Claymore Miner software, and replaces the wallet address on the hosts with its own wallet address. Satori.Coin.Robber is actively mining, with lastest update 5 minutes ago. Claymore Miner is a popular coin-mining software used by quite a lot of mining devices these days. According to its document, the Claymore Miner Windows version provides a remote monitoring and/or management interface on port 3333 (the EthMan.exe file in the “remote management” directory). And by default earlier versions allow not only remote reading for mining status, but also operations like restart, upload files and some other control operations. Apparently, the above feature is a security issue. As a fix, after version 8.1, the Claymore Miner will not use port 3333 but -3333 (a negative one) as the startup parameter by default, which means read-only monitoring actions are supported, but other controlling actions are all denied. But this is not the end. In November 2017, CVE-2017-16929 went public, which allows remote read and/or write to arbitrary files for Claymore Miner. The corresponding exploit code has also been disclosed. 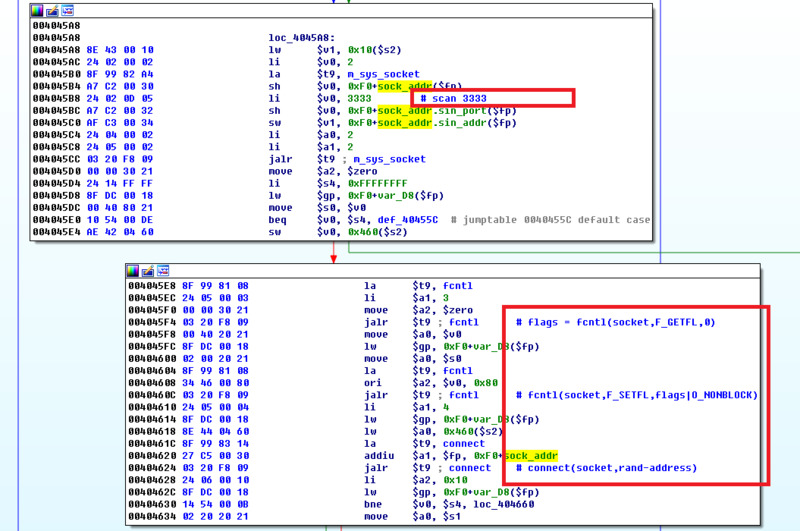 The scanning payload (the exploit code) we are going to discuss here is different from all above though. It works primarily on the Claymore Mining equipment that allows management actions on 3333 ports with no password authentication enabled (which is the default config). In order to prevent potential abuse, we will not discuss too much details in this article. Port 3333: Newly emerged, exploiting ETH mining remote management interface mentioned above. Configurations: The configurations are both encrypted. The encryption algorithm and a large number of configuration strings are the same. For example, /bin/busybox SATORI, bigbotPein, 81c4603681c46036, j57*&jE, etc. C2 Protocol: Satori.Coin.Robber enables a new set of C2 communication protocols that communicate with 54.171.131.39 using the DNS protocol. We will go through the details later. A hard coded IP address 54.171.131.39, located in Dublin, Ireland. The communication protocol is based on DNS protocol, which can be tested by query like "dig@54.171.131.39 $DNS-QNAME any+short", and different $DNS-QNAME corresponds to different function. The first two responses are the same mining pool and wallet addresses used by the bot after tampering with other Claymore Miner mining equipment. However, at this stage, it seems that these server returned values is yet to be used. We evaluate Satori.Coin.Robber's infection scale and trend by comparing the scanning volumes on three ports: 37215, 52869 and 3333. The three figures above show that the scanning volumes of these three ports all increase sharply during this period, which is consistent with the behavior of Satori.Coin.Robber samples.